Some folks say that keeping a record of how many miles you ride takes the fun out of cycling...not for me. I enjoy seeing what I can accomplish as I enter the age of senior discounts at restaurants and hotels. What I lack in miles I make up for in climbing hills. 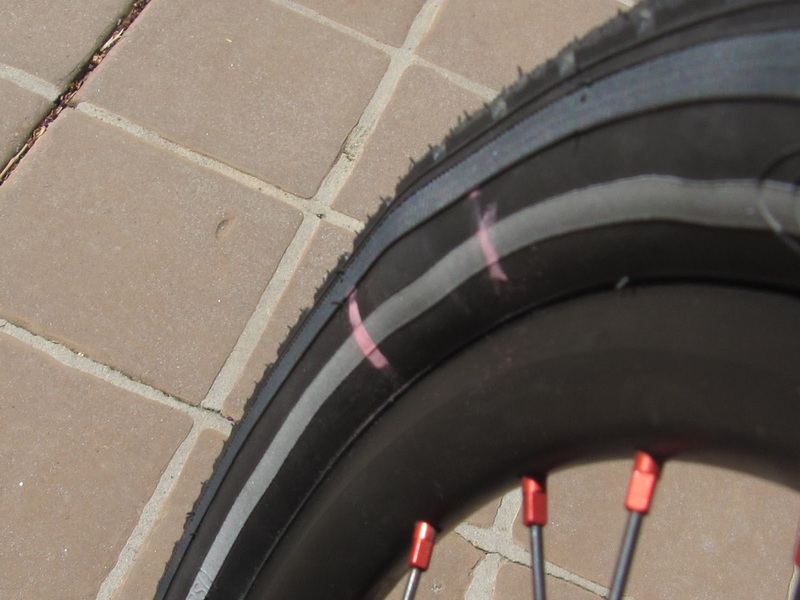 Over the last six months I purchased five Schwalbe tires. 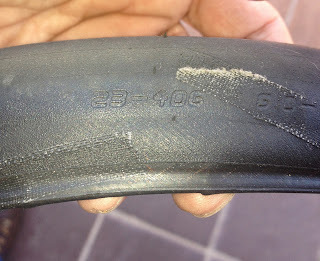 Two out of the five tires had defects. The defective Marathon plus purchased in September of last year was replaced at no cost. The defective Ultremo is in the process of being replaced. Lousy batting average Schwalbe. 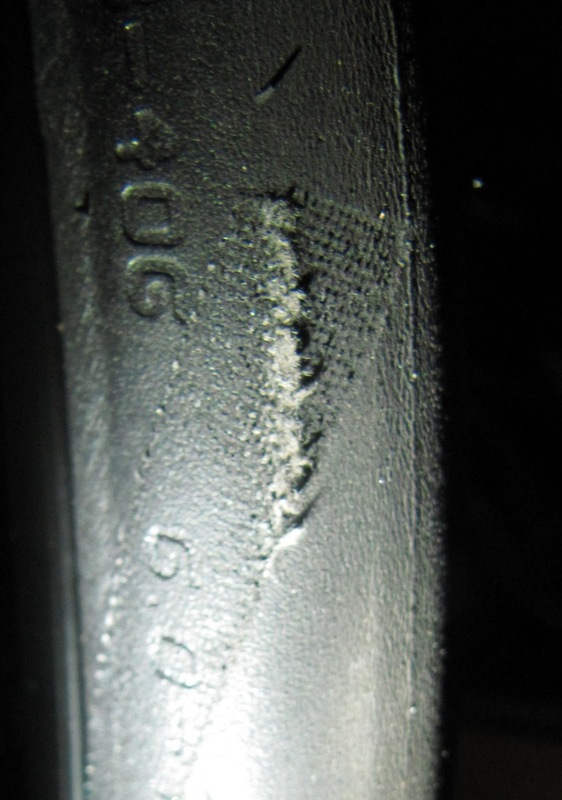 Before sending a replacement tire the folks at Schwalbe told me to send a picture of the defective tire cut in half and then they would send out a new tire. I wasn't happy do it because the defective tire could still be used in a pitch as a temporary replacement if the need ever arose. Without a tire for the 700 the "Mistress" sits idle until Schwalbe sends me a new one. I have the Expedition so I'm not totally without a ride, just no options. 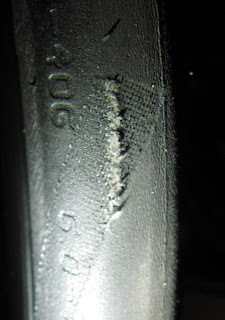 This is the Schwalbe 20" x 1.75" (47/406) Marathon Plus I purchased in September of last year for my Catrike Expedition. Nice bulge!! "As for adjustments, again I must say that the quick release levers on the boom clap just don't do it for me. The boom started to twist a little so I stopped and tighten the clamps and with my heel banged the levers the last few inches to close the boom clamp tight. I'll need to fine tune the boom again. Why not use a nice size hex head bolt that can be tightened properly. Once the boom is set who needs a quick release." It turned out that replacing the boom clamp quick releases on the 700/20 boom with bolts was simple. All it took was a couple M6x45mm bolts and washers. The existing quick release nuts can be used with the bolts. On my latest visit to Bent Up Cycles Dana gave me two bolts to try. I ordered more for my other Catrikes from the Bolt Depot. 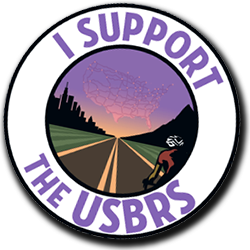 It's .7 miles of a 6% to 7% downhill grade on a wide road with no signals, gentle turns and good pavemen that requires no braking. This is the hill I use to get a good fix on how fast a trike really is. On my old 700 as well as on the new 700/20 I can spin the cranks until I reach a speed of 37mph. After that my legs don't go any faster and any extra speed is in the hands of gravity. All my speeds have consistently been a touch over 44 mph with 44.6 being the fastest. What better way to test the speed of my new Catrike 700/20 set up. The ride today did not let me down I did 45.5mph. To make sure all things are equal.I used the the same method of setting up my bike computer as I have always used. I take a physical measurement of the outside of the front wheel and input the data into the Cateye computer (not fancy but reliable). Also the total miles at the end are spot on with past rides on the same route and with Ride With GPS. According to Dana at Bent Up Cycles the Chris King front hubs take up to 200 miles to break in before achieving maximum speed. Right now if you give the front wheel a little spin it will slow down faster then a hub that is broken in. I ended my ride short at 16.1 miles (1,690 feet of gain) so I could stop at the local school, get some pictures and do some donuts and figure eights to test the stability of my new machine. I also wanted to get back to home to make some adjustments. The Catrike 700/20 (as I call it because of the new 20" wheels) seems just as stable as the old 700 with 16" wheels and lower ground clearance. The extra bit of ground clearance on the 700/20 provides a little more confidence going over speed bumps and the like without compromising stability. It's to soon to tell but I actually felt that I had more control of getting the inside wheel to lift on a tight turn then on the old 16" wheel 700. As for adjustments, again I must say that the quick release levers on the boom clap just don't do it for me. The boom started to twist a little so I stopped and tighten the clamps and with my heel banged the levers the last few inches to close the boom clamp tight. I'll need to fine tune the boom again. Why not use a nice size hex head bolt that can be tightened properly. Once the boom is set who needs a quick release. 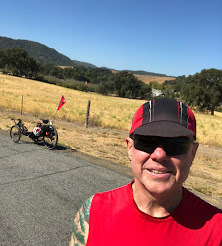 The new and lower 25 degree recline on the seat position seemed more apparent after a few miles and my headrest was adjusted poorly so resting my head on the climbs was not really an option. It was still very comfortable but I missed the use of my headrest for those moments when I normally use it. Overall the ergonomics seemed improved and I felt I could get more power to the crank. 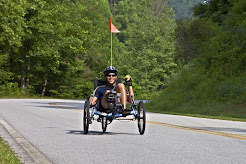 It will take many more and longer rides to truly get a feel for the new Catrike 700/20. Overall this is a fast machine that has taken the 700 to the next level. The new 700 is loaded up, tweaked and ready to take off the stand. Yes there are red front hubs on my new ride...Chris King to be exact. Thanks to Dana at Bent Up Cycles. I won't be able to give it a real workout until Sunday. So far only a few up and down passes and some tight turns on my street to make sure nothing flies off, rattles. twists or makes unwelcome noises. There's a few things worth mentioning at this point in regards to how the new 700 compares to the old 700. The first impression when looking at the 700 is that it seems "longer" then the one inch Catrike claims to have added and it looks awesome. It's been narrowed down as well and when sitting in the drivers seat it is apparent. Careful adjustment of the handle bars is needed to get as much room as possible in the cockpit when turning and at the same time keep the knuckles away from the tire. No big deal here. The little extra ground clearance is a welcomed change. The change in the seat from a 27 degree recline to a 25 degree recline is not that noticeable. Longer rides will give me a better feel for the new ergonomics of the new 700. It's to soon to tell but so far the the 700 seems as stable as it ever was. The one item I have never been a fan of is the quick releases on the boom. I've never been able to hand tighten the boom enough on any of my Catrikes to prevent the boom from twisting under pressure. If I can close the quick release by hand then the boom is not tight enough. I hand tighten the quick release enough so that I have to use a rubber mallet to get that last bit of closure of the quick release lever. One final note...the Catrike bags just manage to work. The triangulated area where the bags are mounted are a bit compressed and elongated. The new 700 at home before setting it up with my stuff. Final view for now. More pics and test ride to follow. I dropped off my old 700 at Bent Up Cycles today. By tomorrow it will be my "new" 700 with reconfigured frame and 20" wheels. Stay tuned for more details. Dana Lieberman, owner of Bent Up Cycles, holds up the new 700. Dana wastes no time and gets started on transferring components from the old 700 (on the right) to the new 700.